U.S. attacks refugee caravan with tear gas at Mexico border | Fight Back! San Ysidro protest in solidarity with refugee caravan. San Ysidro, CA – U.S. Border Patrol agents fired tear gas and rubber bullets into Mexico in response to a march organized by refugees, including many women and children, seeking asylum. 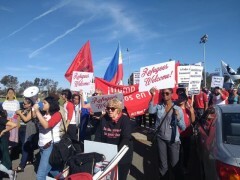 The march had remained peaceful until Mexican authorities forced the refugees marching into a canal separating San Diego and Tijuana, according to the American Friends Service Committee. It was then that Border Patrol agents fired tear gas, flash bangs and rubber bullets into the crowd. One young girl is reportedly in critical condition after being "struck with tear gas" according to the Movimiento Cosecha. The world's busiest border crossing was subsequently closed on both sides. The refugees are part of the larger refugee caravan of about 5000, made up of people fleeing Central American countries. The United States has backed right-wing coups and militant repression of workers’ movements over many years in these countries, leading to a mass exodus of people seeking to escape the escalating violence. Rather than allow refugees to apply for asylum, particularly given the role the United States played in the declining conditions of their home nations, the Trump administration has instead dubbed this an "invasion," and deployed military troops to the border. The U.S.-Mexico border has become increasingly militarized over the past 20 years and even more so in the last several months. 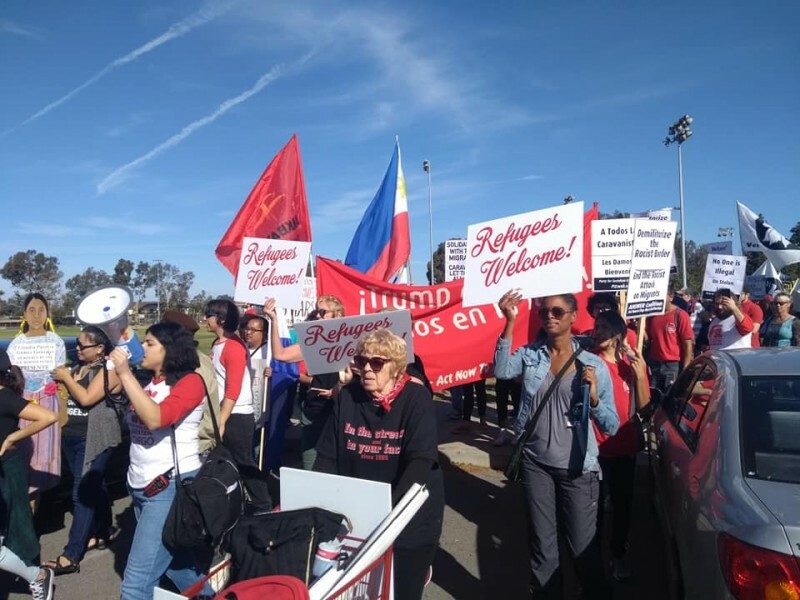 In response to this increasing militarization, a coalition of local San Diego and Los Angeles political organizations and immigrants' rights groups organized a march in solidarity with the refugee caravan. More than 500 people came to show support, chanting slogans like "Somos un pueblo sin fronteras" (we are one city without borders), "No borders, no nations, stop the deportations," and "From Palestine to Mexico, these border walls have got to go." The march began around 10 a.m. in San Ysidro on the U.S. side of the border, several hours before attack on the caravan.